Got back up fishing on Lake Champlain this morning. We fished from 7:45 am to 4pm. The fishing was about on par with yesterday but the thicker concentrations of fish had moved slightly south. There weren’t any special lessons learned today other than reinforcement to not fishing an unproductive hole for too long. Most holes still held fish but they weren’t always in a feeding mood. There was the potential today to waste a lot of time on fish that you would have to work very hard to catch if you weren’t proactive in pursuing them. One technique that I had great success today was fishing right on the bottom with slack in the line. The last few trips I have taken on Lake Champlain have had me trying to perfect this way of fishing. Lots of the fish I have pulled recently have had small snail like shells in their mouths so I assumed that they were feeding right off the bottom. I drew this conclusion because there are very few weeds in the area and there are so many fish… They have to be feeding locally. Basically, I lay my jig right on the bottom and wait for the line to move from a fish swimming away. Every once in a while, if the fish don’t take it, I pound my bait a few times to stir up the sand/muck which rings the dinner bell. 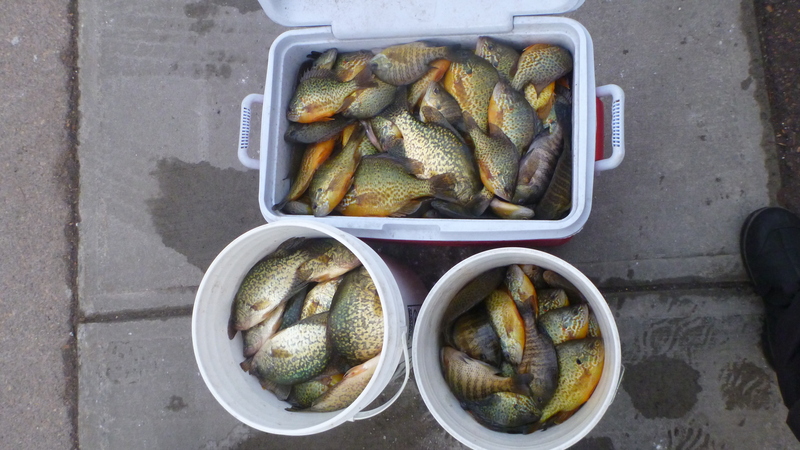 I caught 8 of my 11 crappies and a decent number of the gills/seeds this way today. If you are going for numbers this technique is less productive but it is great when the bite gets tough. The majority of the fish today were caught using a vertical Caty jig tipped with a J & S Plastic. The color didn’t seem to matter much as the fish were always active in at least one hole. Very good tip on leaving the jig on or very close to the bottom. Tried it out south of the bridge RT17 on champ. This was the only way I was getting bites. Thanks! Glad you are getting something out of this blog Jake! Come to the tournament this weekend! Thats a nice mess of fish.